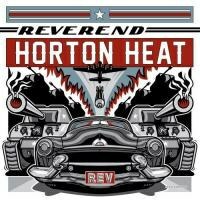 After a brief detour into alt-country flavored punkabilly, Reverend Horton Heat sparks up some more of their old fire on their 11th studio album. The Reverend Horton Heat have always been known for an oft-imitated, rarely well duplicated brand of psychobilly with their best tracks speeding along at 200mph and not letting up from start to finish. The opening track on REV, "Victory Lap", seeks to remind listeners of this fact. Previous effort Laughin' and Cryin' with the Reverend Horton Heat was pleasant enough, but came across as a bit too relaxed in places. This is a word seldom applied to this band, with only a few exceptions throughout their recorded history. This rejuvenated punch suits them well as they slide deftly from intro into the second track "Smell of Gasoline". They have done many a song mining the tough girl vibe, but here there’s a virtue in sticking to what you know. It is also a refreshingly vibrant kick-off to this album. Frontman Jim Heath’s pointed political commentary sneaks its way in once again with "Never Gonna Stop It". This entry in their oeuvre is a marked improvement over the previous album’s most obvious entry in that category, "Rural Point of View". While "Rural Point of View" made a good point but could come off a bit heavy-handed as it did so, "Never Gonna Stop It" is music cut from a bit more of an upbeat, survivalist cloth. The message is far more relaxed, but still with an iron fist clenched tight, pummeling through the speakers. This isn’t an easy balance to pull off, but when it works, it showcases some of the best things this band can do. Past this little gem, Heath and co. take an appealing detour into surf territory with "Zombie Dumb". Their music could be called surf-infused punkabilly, rock and roll drenched psychobilly, and the list goes on. What is still true 11 albums in lies in their ability to sound amazing when they hew a bit more heavily towards a particular end of the musical spectrum. Not that the blended tracks sound bad, mind you. This track is merely a nod to the fact that a sharper focus helps to bring the best of what they have to the fore. Coming into the second half of the disc, Reverend Horton Heat continue to show a knack for making even a song about being down on your luck sound flying-off-the-rails upbeat and catchy. "My Hat" may be an anthem of a guy who can’t catch a break, but it certainly makes being in that situation sound like a walk in the park. "Let Me Teach You How to Eat" is one of the few head-scratchers on the album. It toggles between pure, up front psychobilly and something that sounds like the leftovers from a Royal Crown Revue studio session. Here is one of the few moments where the chaotic brew of sounds they bring to the table just doesn’t gel like it does in their better songs. Thankfully, a better song comes right after with the love-struck bouncer "Mad Mad Heart" which is equal parts psychobilly and thick-pompadour-sporting Brian Setzer styled groove.